A ‘normal’ computer mouse is an important part of any CAD workstation. It is light, compact and easy to operate. However, it poses one major disadvantage from an ergonomic point of view, in that you always have to operate it using the same hand. When a mouse is used intensively with repetitive patterns of movement, this can result in pain and functional impairments, also known as RSI syndrome or ‘mouse arm’. Using a 3D mouse can prevent these symptoms, while making your CAD workflow considerably more efficient and healthier. This was proven by an experiment carried out by the Fraunhofer Institute for Industrial Engineering (IAO). You always use the same finger to click or operate the mouse wheel when using a conventional mouse. A 3D mouse takes on the tasks that you previously carried out with your dominant hand. The strain is spread across both hands, rather than just being focused on one. This reduces finger movements by 28.6 per cent. Strain on your hand musculature falls from a dangerous level of over 1,800 movements per hour to an acceptable level of 1,336 movements per hour. Working with two hands – with a 3D mouse in your left hand and a conventional mouse in your right hand – helps you to maintain an upright posture while seated. Both arms lie on the desk in parallel. The ergonomically shaped hand rest of the 3D mouse also ensures that your wrist remains straight. After a short period of getting used to this way of working, your hand will enjoy a comfortable and cramp-free position. This prevents you from having to overly contort your hand or arm. Excessive strain on one side of the body is a symptom suffered by many CAD users, who put one-sided stress on their hand and arm musculature by carrying out repetitive movements. Using a 3D mouse greatly reduces the need to switch between your mouse and keyboard. Freely configurable shortcuts and keyboard switches relieve your hand and arm, while also increasing your performance by up to 28 per cent*. 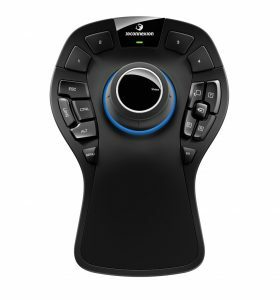 The tactile shape of the buttons makes the mouse intuitive to use, with minimum finger strain. *In the laboratory study, the amount of time needed to complete a random task was reduced by 28 per cent (from 96 minutes to 68 minutes per task) when using the 3D mouse. 3D navigation using a SpaceMouse Enterprise is an outstanding experience, as it facilitates particularly intuitive and user-friendly workflows in professional environments. This was confirmed in the Fraunhofer study, which determined a SUS value* of 86.3 for the 3D mouse. A normal mouse and keyboard setup merely offers a satisfactory degree of user-friendliness (SUS value: 62.3). *The System Usability Scale (SUS) is a ‘quick and dirty’ method of measuring the usability of an application. The SUS scale goes from 0 to 100. Solutions with a score of 68 and above are considered to have at least good usability. The SpaceMouse© Enterprise Kit offers professional engineers the tools they need for an ergonomic and efficient two-handed way of working. Its ergonomic shape supports a natural, healthy position for your hand, and it is the right choice for you if you spend all day working in CAD applications. It offers 31 freely programmable keys in total, whose layout and feel make the simple to operate. The ergonomic full-size design fits perfectly in the palm of your hand if you are right-handed. PTFE feet and the 8,200 dpi laser sensor make the mouse simple to move and prevent additional strain on your wrist. The mouse offers seven keys in total, including three mouse keys. The low-friction surface developed for CadMouse sensors ensures that your hand movements are detected precisely for an exact translation into cursor movements. The compact middle layer guarantees a high degree of stability. The silicone base prevents accidental slipping while you work.